We will be kicking off the South German activities of our Eco Innovation Alliance at Bits & Pretzels on October 1 in Munich. 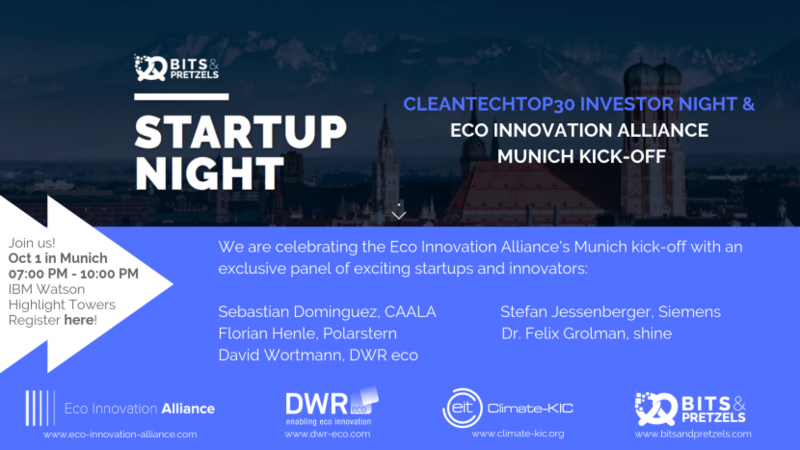 Together with our partner Climate KIC we will be hosting a great panel discussion as part of the Bits & Pretzels Startup Night. With an exclusive panel of exciting innovators and founders (CAALA, Polarstern, Shine & Siemens) we will be speaking about recent developments and current challenges for startups in the clean tech and energy space. Join us for an evening of pitching, networking & drinks! The Eco Innovation Alliance brings together startups, innovators, investors, media, partners and others interested in the cleantech scene to strengthen our voice in the startup ecosystem and open a dialogue to overcome regulatory and business constraints and enable eco innovations. Bits & Pretzels Founders Festival 2018 connects 5,000 startups, investors, startup enthusiasts and decision-makers of the startup ecosystem! Former Formula One World Champion and investor Nico Rosberg, Founder of the #MeToo Movement Tarana Burke and German satirist Jan Böhmermann are just some of the inspiring personalities that will speak about their experiences, mistakes and visions. The three-day festival is taking place around the Oktoberfest in Munich from September 30 to October 2 and brings together some of the most successful founders as well as aspiring entrepreneurs from all over the world.